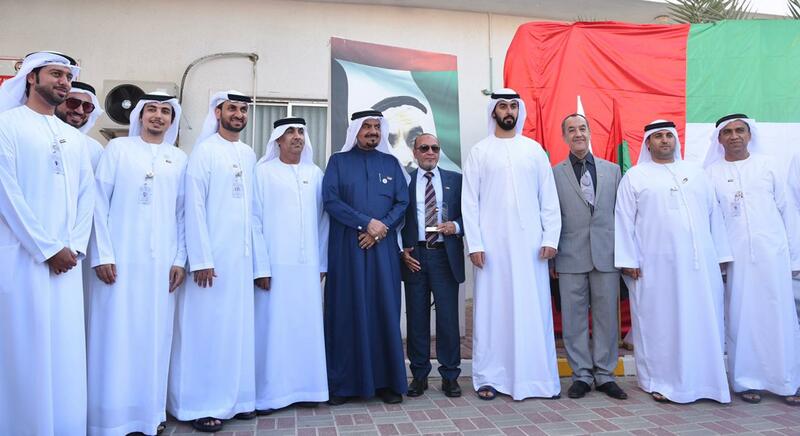 Sheikh Ali bin Saud bin Rashid Al Mualla, Chairman of Umm Al Quwain Municipality, witnessed "Zayed Festival" organized by Emirates Canadian UniversityCollege, under the patronage of Sheikh Ahmed bin Saud bin Rashid Al Mu'alla, Deputy Chairman of the Executive Council of Umm Al Quwain. The festival was organized by four students from Mass Communication Department, (Saif Al Habsi, Mohammed Ghanem, Ahmed Al Shehhi and Faisal Al Shehhi) as a graduation project , and to celebrate " Year of Zayed". coinciding with 47th UAE National Day celebration. The event, which was attended by directors of the Emirate local and federal departments, and the academic and admenstrative staff of the collge , included a seminar on the late Sheikh Zayed bin Sultan Al Nahyan, may God have mercy upon him. Sultan bin Rashid Al Kharji, advisor to the UAE's health minister,and Col Ahmed Saeed Al Sam Al Naqbi, director of the traffic and patrols department, RAK Police, highlighted ,during the seminar , some stations of the biography of Sheikh Zayed, may God have mercy on him.They spoke about his determination and wisdom in facing difficulties and challenges, his keenness to enhance security and safety, and provide all the elements might have contributed to this, and his vision, which brought the UAE to this great position Among other countries. Umm Al Quwain Cultural Center organized a photographic exhibition about Sheikh Zayed, In addition to some traditional dances performed by folklore groups, and allocating several corners, including the traditional handicraft corner, Al Henna drawing corner, Story telling corner,and the corner of traditional Food . At the end , Sheikh Ali bin Saud bin Rashid Al Mualla honored the participants and contributors to the success of the festival.